I was six years old in 1983 and I was living in Galaţi, Romania. One winter afternoon, I was standing with my father in line at the grocery store, packed between dark, heavy woolen coats. Neon lights buzzed and flickered above our heads. The woman behind the counter wore woolen fingerless gloves and a sleeveless jacket over her white uniform. Behind her, stacked plastic crates, most of them empty. We were far down the winding line, but I could smell the bread. My stomach rumbled. My feet were numb with cold. Every few minutes, I abandoned the pattern my boots had made in the dirty snow on the floor and took another step. I became familiar with the shoeprints left by the people in front of us, identical prints belonging to faux-leather or rubber boots bought from the same state-owned shoe-making factory. My father pulled out the dog-eared piece of construction paper with our family’s name on it. Four members, half a loaf of bread each—no matter if we were adults or babies (a trick to encourage baby-making). The cashier blew on her ballpoint pen to warm it up and scribbled an X next to the other Xs on the calendar. My father dropped the coins on the counter, slipped one loaf into his raffia bag, and gave me the other one. I sank my teeth into the cold crust at one end. It was good. Cold and chewy. I swallowed and took another bite. It was good. I passed the bread to my father. He tore off the other end and shoved it into his mouth. Crumbs peppered his mustache. People frowned at us. We made our way along a dormant stand that used to sell cheese, but had none that week. We heard the cashier’s crabby voice behind us, “Last crate, comrades!” and hurried into the cold and dark outside. I held my father’s hand. We walked back home, through the snow, chatting and eating bread. 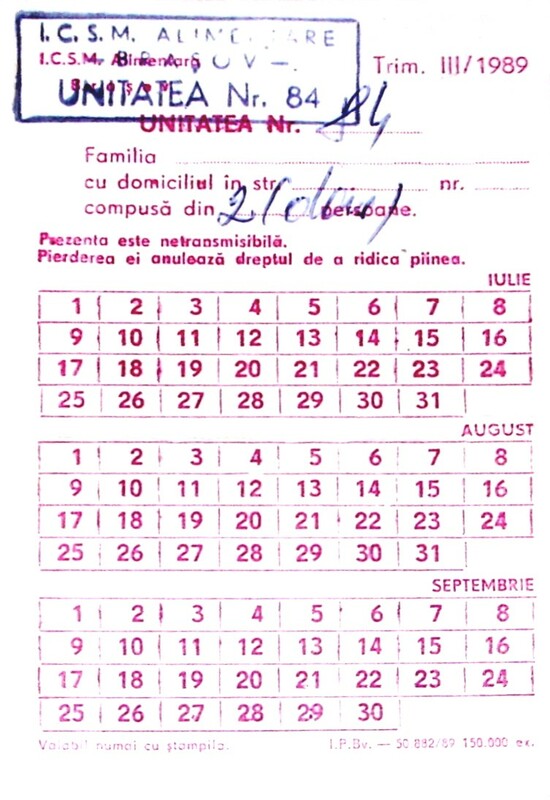 In May 1983, Radu and Florina (names changed for privacy reasons) got married. They had been together for a long time and shared a passion for rowing. In August 1983, Radu, Florina, and a good friend of theirs, Iulian (name changed for privacy reasons), were ready to try out their bold new plan. What if they sailed east, then south across the Black Sea and landed in Turkey? All three of them used to do competitive rowing. Of course, there were many dangers. They had to break through a five-kilometer wide corridor along the Romanian shore patrolled by military vessels, they had to keep only to the open waters, away from the Romanian and Bulgarian—and even the Russian—shores, and they had to cover a distance of more than 350 kilometers just by rowing. They went down the Black Sea shore and for a week they searched for a good spot to set sail. They found one. They checked the weather forecast, which covered only two-three days of unreliable prognostication. It looked like good weather near the coastline, so they hoped to have good sailing weather on the open sea. And they hoped to reach their destination in three days’ time. Radu’s mother gave them money to buy an inflatable boat from some Swiss tourists. Because the boat was big and orange, they couldn’t take it out on the water during the day. On Thursday, August 18, 1983, they hid the deflated boat and a few provisions (food, fishing rods, two square meters of sailcloth, bicycle pumps, oars) behind the big rocks of the jetty in the sea-village of Olimp, and spent the afternoon and evening pretending to be fishing by the jetty, watching their cargo in turns, wary of children and beachcombers. After dark, Radu and Iulian began inflating the boat. Florina kept watch. It took them a long time to inflate the boat. They were about done when a patrolman showed up on the jetty. Florina alerted them. They scrambled to prop their bright orange boat up against the rocky wall. They held their breaths as the soldier stood on the rocks of the jetty and searched the waters below. When the soldier finally went away, they threw everything in the boat, pushed the boat out, jumped in, and started rowing. A Swiss inflatable boat is a safe boat and the white plastic oars glow in the dark, for safety reasons. Radu and Iulian rowed, one on each side of the boat, keeping the oars deep in the water. Florina held the compass. They headed straight east, toward the open waters and the coast guard vessels. It was close to midnight when they got close enough to the coast guard boats. They were afraid of being heard, being seen or spotted on the radars. They waited in the dark and figured out the moving patterns of the vessels. The boats covered long distances, always in pairs, moving toward each other and passing each other. They waited and slipped through right after the boats moved away from each other. The dolphins followed. Eastward they rowed until they saw a bright spot on the horizon. As they drew closer, the spot turned into a multitude of lights, until at dawn they saw a huge cruiser in the distance. People with fishing boats anchored by the cruiser hauled crates big and small up and down rope ladders. Radu, Florina and Iulian rowed past the trafficking spot without drawing attention to themselves. By morning they were all tired. Radu kept rowing while the other two slept. He changed course southward, toward Turkey. They turned one of their oars and two pieces of their fishing rod into a short mast and tied the sailcloth to it. They steered it with a rope to catch the wind, and used the other oar as a rudder. They sailed with the south wind faster than they did when they were rowing. When the wind was gone, they rowed again, taking turns. On Sunday afternoon, the wind changed coming from the east. It grew stronger, pushing them back toward Romania. They dropped the sail and used the compass to row westward, against the wind. Soon they noticed that their boat was losing pressure. It had six inflatable sections and the sides started to soften up under the hammering of the waves and the weight of their own bodies hitting the boat with each jolt. They couldn’t inflate the boat while sitting in it—the rubber would have cracked. They jumped out of the boat but had no stable, solid surface to push against. Note: I met Radu Codrescu (name changed for privacy reasons) in 2001 in Redmond, Washington. In 2002, we sat down for a series of interviews about his past, and we continued our conversations in 2006 and in 2013. The series Our Borders is based on those interviews and on my own experience of growing up in Romania during the ’80s and the ’90s. This entry was posted in Modern History, Our Borders and tagged Black Sea, communist Romania, escape attempt, illegal border crossing by Roxana Arama. Bookmark the permalink. Sounds harrowing, but also a testament to the strength of their desire to escape. The visual media also helpful, zeroes in on that part of the world. I am very curious to know how it turned out. Thanks, Scott, for following this story. You know a lot about that part of the world and I’m glad you think I got it right. I’m working on more installments, all the way to [Radu’s] eventual arrival in the US. I hope you’ll find it interesting. Great story, reminds me of the time when I was 4 years old and my grandfather was waking me up at 5 in the morning in Galati to go with him and stay in queue for milk since they would only give us 1 bottle of milk per person staying in the queue. In the end I think that made me stronger, in the spirit of “How the Steel Was Tempered” by Nikolai Ostrovsky. I think my family had an alternate way of getting those bottles of milk, because I don’t remember waiting in line before dawn. I have to ask them. As for getting strong, sure, I got my share of lines and of standing in the sun for hours during those work visits that the President used to take throughout the country. I should read Ostrovsky’s book. I remember the title, it was famous, everybody knew it, but I never read the book. I wonder where I can get a copy these days. Thanks, Ionut, for jogging my memory! Roxana: This is a story of three heroic people. I’m waiting for the final installment. Thanks for showing us what courage and endurance are in the quest for freedom. We forget it too soon. Those were dire times and young people were desperate for freedom. But I think that these three people were more alive than most their compatriots at the time. Waiting for next installments. Love your writing!